The Honorable Jesse S. Cartrette, Jr. was born in Florence, South Carolina in 1979, the oldest of three sons born to Jesse Cartrette, Sr. and Gail Sturgeon Cartrette. After serving as Student Body President and receiving an academic letter jacket, he graduated double-cord from South Florence High School in 1998. The first member of his family to attend college, he was an honors student at Francis Marion University, where he graduated with a Bachelor of Science degree in Political Science in May of 2002. He was a member of the first graduating class of the Charleston School of Law (“Charleston Law”), where he was a founding member of the Christian Legal Society and served as one of the first class of justices seated on the law school’s student-led court formally known as the Honor Council. Judge Cartrette was awarded The Civility Award, Charleston Law’s highest honor, by election of his peers, just before receiving his Juris Doctor degree from the Charleston School of Law in 2007. 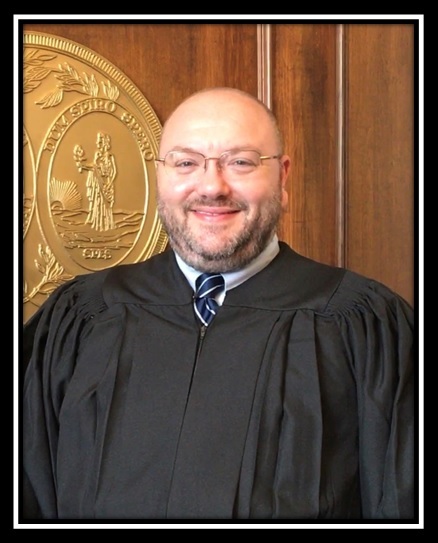 After graduating from law school, he had the honor and privilege of serving as a Law Clerk for the Honorable Thomas A. Russo, Judge of the Twelfth Judicial Circuit Court of Common Pleas and General Sessions. Cartrette was then admitted to the South Carolina Bar in May of 2008 and formed his own private law practice in Florence, South Carolina in November of that same year. He was admitted to practice in the United States District Court for South Carolina in May of 2010. Prior to his election in 2018, Judge Cartrette’ s community involvement included serving as a proud member of the Florence County Bar championing and protecting the rights of underprivileged clients in our community including, but not limited to, senior citizens, abused and neglected children and vulnerable adults. In his legal career, Judge Cartrette became an accomplished and respected attorney, mediator and guardian ad litem in the Probate, Circuit and Family Courts of Florence and the surrounding Pee Dee Area counties. He has also served as an adjunct professor of business law for Limestone University. Judge Cartrette has previously served on the Board of Directors for the Florence County Senior Citizens Association and as a member of the Florence Rotary Club. He is also a Paul Harris Fellow. Judge Cartrette enjoys spending time with his family and friends, He attends Christian Assembly Church in Florence, South Carolina, and is passionate about helping those in need in our community and frequently participates in various community service projects, promoting charitable organizations and engaging in other philanthropic endeavors to benefit local artists; farmers; homeless and disadvantaged members of the community; disabled veterans; religious charities; children’s and high school sports teams including baseball, softball and basketball; and working on initiatives to foster community unity and understanding between people of diverse backgrounds and beliefs. He was elected Florence County Probate Judge on November 6, 2018. Probate Court has original jurisdiction over actions concerning the issuance of marriage licenses, the estate of a deceased person, the Will of an individual, the estate of a minor or incapacitated person, trusts, and involuntary mental and chemical dependency commitments. Most probate matters are handled without a jury trial, but Probate Court does have the authority to conduct a jury trial.